Group portrait outside Robertson Memorial United Church (93 Pine Avenue North, Nakusp) of people gathered at birthday party, 4 May 1943. TOP:Mrs. Leticia Bill, Mrs. Harrison, Mrs. E.C. Johnson (Kate Johnson), Mrs. McWhirter. 2nd FROM TOP:Mrs. Fowler?, ? Coates, Mrs. Ion, ?, Mrs. McRoberts, Mrs. Miller. 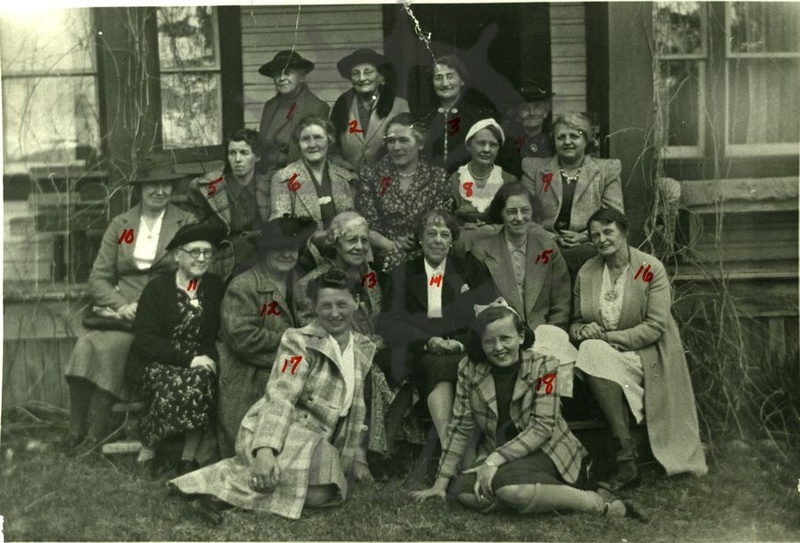 3rd FROM TOP:Mrs. Hamling, Mrs. Thurgood, Miss Fawcett, Mrs. Reilly, Mrs. Grondahl, Miss Rhuie Hamer. BOT:Mrs. Hoy, Betty Miller. Photo given by Rhuie Hamer to Alfred Watson and Katherine Watson.